Just 3 o’clock in the afternoon, and the red sun rolls over the horizon like a gigantic chariot wheel rushing away in a hurry to reach friendlier regions of Earth, leaving the sky in a sweep of red, lilac and yellow. The country is white with long shadows of the sparse trees here and there, like fingers on the snow. The wind blows from the Northeast, coming from the Chuckchi Sea with nothing to stop it before it hits the small village of Shismaref. November 1963, a November like all Novembers, a winter like all winters. Jim Siukpuk, deeply entrenched in his parka, empties his sled. Collects harnesses. Drags the frozen prey into his cabin, booty from his trapper’s trail. His movements are slow. Timeless. His dogs already curled up and sleeping. They worked hard today. Rest well earned. Not often has a Siberian Husky been working as a sled dog so close to his country of origin, on the Kamchatka peninsula, where the Anadyr and Kolyma Rivers flow. All it takes is crossing that small frozen sea between Alaska and Siberia, the Bering Strait. His dense plush coat is more than enough to protect him against the wind and low temperatures. Blinking with his one blue eye to the world around him, he pulls his tail over his head and sleeps. A young silver gray male. Not perfect, according to the Breed Standard. Maybe, but a true working sled dog for sure. His mother Sinyaya Troika. His father: Blizzard. The story of a sled dog - there are many to tell. Or maybe not. There are legendary dogs whose stories live on. Their names are well known to every musher around the world. Togo, Nellie, Nicolai, Aladdin, Astro, to name a few. Stories often going back 100 years, but some just beginning. Will this story be one of them? Born on the Howling Dog Farm near Anchorage, we catch up with him age three years old, living way up in Alaska at Shismaref, farmed out - loaned - to a trapper musher working up there. Jim Siukpuk. “Line Out Malchek” – that he could do and that he did. Perfectly. Keeping that central line straight with enthusiasm while dancing up and down, looking over his shoulder while his team is being hooked up behind him. “Oehoehoe…come on! let’s go... hurry up... what’s keeping you guys?” Why responding to the command GEE (right) seemed so much more fun then HAW (left) we will never know. Malchek never bothered to tell us. There are dogs that, by their temperament and often by the breed they belong to, have great difficulty getting used to a different environment or accept another boss. Not so our hero. Change of scenery to Malchek was a source of inspiration. Pure joy. Life starting all over again. Especially as he grew older, these changes did him a world of good, and made him more vigorous. Gave him energy again. Made him happy. New dogs, new friends, new horizions. After two years he comes back to his home in Anchorage. There he is trained on a regular basis and occasionally loaned to a junior musher, with whom he participates in the junior races. Running swing in a 9 dog team - just behind the leaders - becoming Junior Champion in the Fur Rendezvous Championships that season. A respectable 2 days, 20 km per day race. Quite a respectable trophy too. After all, Rondy was the World Championships at that time. Malcheck is five years then, and in the prime of his life. We are just starting out with the sled dogsport around 1965 and have our first dogs from Earl and Natalie Norris’ Anadyr breeding stock. “Malcheck might be a good help for your team I feel. Maybe you should take him. Watch out for his Gee command though...“ Earl Norris advises us. There he was. Smiling at us, leaning comfortably against his doghouse in the autumn sun. “Come on... take me to Holland…” his silent message. Of course we did. Of course he came to Holland. Who can say NO to Malcheck? He fitted perfectly into our small kennel population and our small team. He took over the Alpha position without any problem, friendly and tolerant as he always was. A gentleman. He knew everything. We knew nothing. Malchek knew that. We knew that Malchek knew that… etc.... etc. New Dutch words were added to our language, sometimes born out of desperation. But in the end... who could stay mad with such a clown up front? One who never forgets a trail once run? Always happy to argue with you? Having the last word most of the time? Yes, you just laugh and smile and love him. Take the beach training, which was considered indispensable by us at that time. Sea, in principle, was ‘scary.’ But not so ‘scary’ to discover that the closer you take your team to it, the easier the running became. In fact, getting the team into the water kept feet and belly nicely cool. We should have entered a sled dog swimming contest with this team. We would have won it I’m sure. During his first European achievement, he left a deep impression. He turned the prescribed two rounds of the 6 km trail of the sled dog race into the First Dutch Victory. The first “Leader” who ran up front all alone. And what is more, really enjoyed doing so. Turning right on command (!) and occasionally to the left as well. A Born Leader, that was what he was! It was pitch dark, with no trail visible in the meter of snow blown every which way. But Malchek, with eight strong dogs behind him... Malchek knew the way. And Malchek knew the way back up. It took them around 6 hours.No more clowning, no more bravado, no more ‘oeoeoe.’ No, this was business. It took trail sense. It took hard work. And that he gave us. That is what brought mushers home no matter what circumstances. Saved their lives often enough. Yes… a true Leader indeed! I don’t have to tell you how proud we were of our “happy-go-lucky Malchek! We all were. That was in Switzerland. Many a trail he has run since then, all over Europe. When the press wanted a ride in the sled, who else but Malchek to put up front? Give them his story? I still have the newspaper clippings. Of course he came back to us for good to reach 13 years of his adventurous life. Knowing that he was resting peacefully in our small graveyard between the trees where all of our faithfuls joined him later, was a good thing to know. A dog like a candle. A candle whose flame has reflected in many eyes. A dog whose life has been as a coloured thread that runs from Anchorage and the Bering Strait via Netherlands, criss-crossing through Europe. “That Crazy Malchek” he is called in Shismaref. “Happy-go-lucky Malchek” in Anchorage. “Malchecco” for his Italian fans... “Ah der Maaalchek” in Germany and Switzerland. The story of just another sled dog, is it? issue of De Hondewereld magazine. Alaskans Malchek of Anadyr. AKC WA944602. NHSB 433511. Tattoo number: no.01 of course! Colouring: silver-grey white, one blue eye. 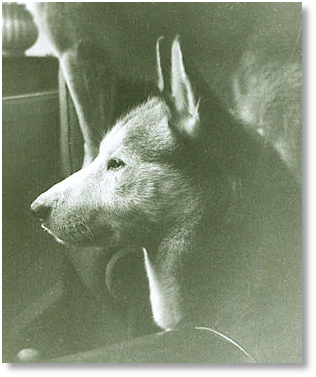 Breeder: Sandra W. Parker, under the kennel name of Earl and Natalie Norris, Alaskan Kennels.